12/4/2012 UPDATE: I took the Tork Trux to the skate park. The trucks performed well, providing a lot of good carving in the bowls and standard performance on the street course. I wasn't being too hard on the trucks, just a few airs and ollies here and there, but I bent the back axle badly enough that I noticed it right away. Granted, I weigh 230 pounds with all my safety equipment on, but I also don't do big drops or giant airs. I usually bend truck axles slightly, but never enough to notice performance degradation. This is a sad end to these trucks. I still have the green set of Tork Trux that I will sell on eBay soon. I will include free of charge the bent black Tork Trux with the green trucks. Look for them on eBay on 1/12/2013, or message me now via the facebook page to buy them from me directly. Bent back axle on the Tork Trux 5.5. Wheelbite galore and squirrely turning. So sad. 11/28/2012 UPDATE: I've been riding these Tork Trux trucks for a couple of days now and I am happy to report that the stock bushings have finally loosened up. Skating the trucks more has endeared them to me more than before. The turning on these trucks is tighter than Indy/Theeve but not quite as tight as Tensor/Thunder. A nice in-between, and it reminds me even more of Krux trucks and my ever-awesome Bear Trucks Polar Bears. Carving is smooth and predictable. Ollies and nollies still pop crisply and cleanly. Wheelbite is not a problem. To fix the width discrepancy, I put three (3!) washers on the inside behind the wheels and no washers on the axle nut side of the wheels. This gives me about 144mm between the wheels, between the 140mm of most 5.5s and the 146-150mm of most 5.75s. I haven't gotten the trucks to the skatepark yet, but that will happen this week, and then we'll see how the treated aluminum hangers grind. Should be fun! Tork Trux: the answer to a question I never had, or the answer to a question I never knew I had? Tork Trux 5.5 in "Mean Green" colorway. In this picture, you can see the shaped cavities where the mounting nuts go. At the bottom of the cavity are cut slots to retain the mounting nuts by their flanges. The hanger design looks a lot like the Element trucks - another truck that Mike V. once skated. that Mike V threw in the towel on the new school popsicles that he was so instrumental in bringing about. Mike V. now favors - once again - a shaped deck with 9.5 x 32 x 15"WB measurements. Tork Trux' 5.5 is their largest truck and is far too small for a 9.5" board. It looks like Mike V. got tired of the novelty of going big on street(free)style boards - something Rodney Mullen did at a demo that was instrumental to fueling Mike V's skateboarding passion. The Bones Brigade showed up at Mike's local skateshop and, seeing the typical East Coast parking lot, shied away from doing a demo because of the rough asphalt. Rodney Mullen, however, skated the demo anyway, earning Mike V's respect. Later, at another demo, Mike V witnessed Rodney pulling a bunch of tricks on the quarter pipe on a little freestyle board while the other pros were using 10x30 pig boards. Back to these trucks. Tork Trux makes skateboard trucks that have a unique and patented baseplate design that eliminates the need for a 3/8" nut tool to mount your trucks - all you need is the included Allen wrench. The Tork Trux mounting nuts have a flange that fits into grooves on the baseplate. The flats of the mounting nuts fit in a 3/8" hexagonally shaped cavity to secure them from turning when you tighten or loosen the bolts. With this feature, you don't have to worry about two tools, you just use the included Allen wrench to put the trucks on or take them off. You can view videos demonstrating this feature on the Tork Trux website. Left and bottom, the Tork Trux mounting nuts. Right and top, traditional 3/8" mounting nuts. Note the flange on the Tork Trux nuts. Way back when, I changed the tire on a friend's car, a Volkswagen Jetta. Now, most automobile wheels are mounted with lug nuts on lug studs. For this majority of automobiles, the lug studs are pressed into the axle assembly mounting hub - much like button kingpins are pressed into our trucks' baseplates. Changing the wheel/tire assembly was facilitated by mounting the heavy wheel on the lug studs, then turning the lug nuts onto the studs to snug the wheel down on the hub. Early 90s VW Jettas, however, were the opposite: the lug nuts were pressed into the hub, and instead of lug studs, there were lug bolts. This meant that you had to somehow bear the weight of the heavy wheel while aligning the lug bolts with lug nuts that you cannot see - all this without cross-threading. It was quite a challenge, way more than it needed to be. Tork Trux are the same way: instead of pushing the bolts through the deck and resting the trucks on the bolts while you hand-start the nuts, you put the nuts in the trucks (and yes, the nuts do easily slide out of their slots if you tip the truck), hold the trucks against the slippery deck, and more-or-less blindly push the bolts through the deck into the mounting nuts, hoping you don't cross-thread and ruin the nuts. Funny enough, this reminds me of mounting trucks on Tech Deck fingerboards, only without the recess to keep the trucks in place. I finally got the Tork Trux mounted by holding the nuts in place with my fingers while I stabbed with the bolt until it caught. Then I turned the crank-style allen wrench to tighten the bolts down. UPDATE: After spending more time with the Tork Trux trucks, I began using a better method: put all the bolts in the deck, line up the trucks, and spin each bolt just until it catches, then spin them all snug one by one. The bolts catch the nuts nicely this way. Tork was right: it does change the way you mount your trucks on the board. In the end, I find it more efficient. The kingpin angle and height of the Tork Trux is very close to the Krux trucks. Due to the discrepancy between the nominal and actual size, these trucks would be more suited to decks from 7.9 - 8.25". These trucks are smaller than advertised. Nevertheless, these trucks feel pretty decent, even if they are a little tight. I still have to spend time with these trucks to reach final conclusions. So far, they feel like Krux and Theeve trucks if those trucks were mounted with very stiff bushings. Tork Trux 5.5 in "Mean Green" colorway. In this picture, you can see the shaped cavities where the mounting nuts go. At the bottom of the cavity are cut slots to retain the mounting nuts by their flanges. Tork Trux 5.5 in "Mean Green" colorway. At first glance, the tip side of the base plate looks like it would be a pain for nose- and tail-slides, but the curved design (seen more clearly in the next picture) looks amenable enough. Tork Trux 5.5 in "Mean Green" colorway. At first glance, the tip side of the base plate looks like it would be a pain for nose- and tail-slides, but the curved design (seen more clearly in this picture) looks amenable enough. Sound off in the comments about your own thoughts! Never heard about them... but thanks for the detailed informations :) I think they ain't the right ones for me as bowl-/ pool-rider. No, no, I wouldn't dare ride these trucks in a bowl or pool. I think newer Ace trucks have a better aluminum for the hanger material. I've had older and newer ones - the older Ace trucks are identifiable by their lesser quality standards with casting marks and misaligned axles, for instance. Newer Ace trucks are higher quality in materials and manufacture. I don't know when the quality improved, it just did at some point in the past 2 years. I tell you, before I skate transition/bowl/pool with a new set of trucks, I go do a slappy session on a curb somewhere to grind some locks into the trucks. Then, when I hit that coping, the trucks aren't as slippery. but hey, I saw the legend Wrex Cook and Steven Pineiro are on Tork Truks, too. "On the board I skated in the Board #1 video I had Indy 169 Trucks, Divine 65mm 78a Road Ripper Wheels and 1/2 inch riser pads. But the next time I set it up I may go a bit more “street” and put on some Thunder 149′s and some harder 58mm Spitfires. It’s all personal preference… Whatever works for you" (Mike V). That's crazy! Thanks for the tip. I didn't know Tony Hawk left Theeve trucks. He skated Trackers in the 80s, Fury trucks later. I can't see him getting on Independent unless he can get some hollow light Indys. Tony's trucks in that picture look more like Theeve TiH trucks, though. I've read awesome things about the Divine wheels. Apparently they've very good for sliding. yeah.. that could be Theeve TiH, too. Hard to see which truck it is on the photo... on the video (http://youtu.be/1FmQzAqKOY0) is also hard to see which one he's skating. Theeve and also Tony didn't wrote why the split their "contract" (one guy ask for it on Theeve FB about it and they just told, he left Theeve). I think the "like" Independent is more than just sympathy... but funny that both archrival Hosoi and Hawk could be under one label (just say "Del Mar Contest 85" ;)). If I could skate like any pro, it would be Mike V. I'd rather be able to do aggro bonelesses like him than the ultra clean (robotic?) style of flip/ledge/handrail that's so popular today. According to this: http://www.youtube.com/watch?v=zYqhDLMqc2w he rides Thunder 149's. I'm not sure if he has a truck sponsor, or has picked one up since starting Elephant, but some in of those older videos he's clearly riding Indy's, and on some of the newer ones it's Thunders. I think most of us old skaters understand sometimes pros ride the brand that sponsors them even if they aren't their favorite trucks. With Grind King's demise, it's good that at least one company is making trucks with a higher grade, heat treated aluminum. No trucks I've owned have grinded better in street situations than my Grind King Jay Adams. Unfortunately they had some design flaws that made them unskateable (at least for me). Just replaced them with some Indy 159's and couldn't be happier. Thanks for the tip on those. Loving the new/old goemetry. Thanks for the information on Mike V. He's one of my favorite skaters. Mike is so creative. Tell me more about the heat treated aluminum. What truck companies use which quality aluminum? Where can I find out more about this? Most definitely my favorite trucks are my Indy 159s. They turn and cruise and handle so well. I switched out the rear top bushing for an aftermarket Independent Genuine Parts Hard (black) bushing, but kept both barrel bottom bushings and front top stock bushing. I wish the Genuine Parts bushings would come in barrel bottom style now that the Indy lineup has made the switch. 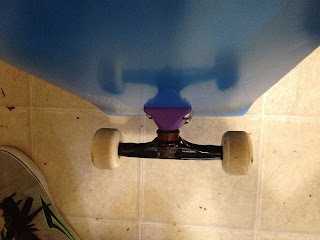 I've used Bones Bushings in the 159s, too, and they're all right but too tippy because of the conical bottom bushing. Still waiting on a pair of 149ers with that good old geometry. Also I am very thanksful about the bigger distance between kingpin nut and hanger top. Well, as most young skaters are probably not aware, "aluminum" is not pure aluminum but usually some type of alloy. Different aluminum alloys are used for different things, and the higher "aircraft" grade alloys are generally more expensive. Most of them use a fair amount of copper, currently a very expensive metal. Also the added step of heat treating the final casting adds to the cost. The only company that I ever heard of using T6 heat treated aluminum for their hangers was Grind King. That is, until I looked at the Tork website. Really all we have to go on is what the manufacturers tell us, and they usually don't. Unfortunately the industry is driven by the wants of 14 year old boys, although that is changing with lots more skaters keeping with it into their 40s and beyond. I certainly noticed a difference in how smoothly the Grind Kings grinded in street situations- waxed/painted curbs, etc. I didn't notice any difference on metal skatepark coping. I think it's safe to assume a harder metal will grind more smoothly over rough surfaces. Your results with the Theeve TiH seem bear this out, although the hangers were apparently too slippery to be predictable in the park. They might be perfect for someone who only skates street obstacles. maybe am I wrong but is "T6 heat treated aluminum" and "356-T6 aluminum" the same? Cause Stage 10 also use that (2nd) in hanger and baseplate (axle are made with 4140 chromoly)? There is a lot of interesting information there. I am a hobby welder, so it was interesting to see that T6 aluminum can be TIG or MIG welded at a loss of strength but heat treated again to gain strength back. Interesting. It may appear unfortunate that the industry is driven by teenage customers, but that is just good business. Chevy wouldn't have the Corvette if they didn't sell Malibu models en masse. The longboard world seems to be more technology focused towards performance and durability, while the trickboard world is more focused on lightness at the expense of durability, longevity, and even safety. It is good to see that companies are beginning to cater more to the performance requirements of adult street/park skaters: 1031 Skates, Elephant Brand, Powell Peralta, Deckcrafters, Welcome Skateboards, Dopamine, Pig Wheels, Independent (with their 159 and 169 trucks). The teenagers keep the companies' doors open, but the adults keep the companies going in the long term. I venture to say that a majority of teenagers buy one set of Independent trucks and skate those trucks for 3 years until they quit skating. Meanwhile, adult skaters buy a new set at least once a year for many years. So, Indy has volume sales with the "let's try skating" customers, but they have dedicated repeat sales with the core customers. Like I said the only company that I heard using it was Grind King, because they always mentioned it in their advertising. But now that Chris pointed it out, Independent is using a similar alloy as well. My point was, this may actually be common in the industry, but truck manufacturers don't bother mentioning it (until recently?) because their main (young) customer base doesn't understand or care about technical details like that. And at one point we were all part of that demographic. The only reason I know about this is from when my friends and I got into old hot rods and motorcycles (which is also around the time a lot of us stopped skating!). I was talking to my local skate shop owner, and we were theorizing if maybe the difference between the way the different ermico trucks grind might be something as simple as the shape of the hanger, or the amount the hanger gets polished. I think Bertrand is right though, there is definitely a shift in the industry and older guys like us are back in the equation. Just the fact that Indy has pro models for Duane Peters and Salba right now is a sign. I think this is basically just a numbers thing. There was always a few guys around when we were young who never stopped skating. But it seems like now there are a lot more of us, and frankly, we have more money now than we did when we were 19! BTW if you guys like Mike V's creativity check out some Patrick Melcher. All in all good point about the material.. always read that in advertisment of Independent but didn't make that much tought about it. About the age... I think Independent is one company with the olders "team riders" special in bowl/ pool division. I think the biggest part of the bowl/ pool division is def. over 30+ like Peters, Alba, Grosso, etc. Patrick Melcher is one of my fav. skater when it comes to "creative" Skateboarding. A legend cause he found, back in the days, his own style of skateboarding that makes him so special (to me). What is the best skateboard tool? Do you balance your boards on a nail?